What’s the next part of you that is being born? And are you paying attention to what it needs? I was about to make a right turn onto a busy two-lane street today when I noticed that the cars in the left lane had come to a halt. I thought the girls sitting in the red car at the front of the line must be having engine trouble. But as I made my turn into the right lane, the car in front of me stopped, too, at exactly the same spot those girls had. What was going on? Then I saw it. 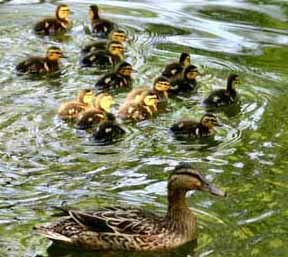 For one long, sweet, breathtaking moment, I watched a speckled mama duck proudly waddle across the lanes with a dozen speckled ducklings falling over each other to keep up with her. They tumbled onto the curb in beautiful disarray like something out of slapstick routine as the mama pushed ahead in pursuit of safety. Thank God for careful drivers, I thought. And thank God for mothers. That heart-opening moment made me think about the fragile things in life and our own role as mother. We are all mothers. In each of us, there is something young and tender that needs our guidance, nurturing, and maybe even the fierce protection of our love. Identifying what that is at this particular moment in our lives, I realized, can help us play our role of “mother” better. It can help us focus on exactly what most needs our compassionate attention so it can grow to its fullest and express itself. What are you meant to be mothering within you right now? Maybe it’s a new habit you’re trying to give birth to or an undervalued quality or talent that needs shaping and support. Perhaps what needs tending within you is some aspect of hidden creativity or emotional distress or a mission-driven project waiting to see the light of day. Are you taking care of your inner duckling? Are you paying attention to the next part of you that is being born? Or are you too busy to recognize what it is? When we’re too busy to focus on what’s really important in our lives, the part of us that is just budding or is still a seed can become smothered instead of mothered. Is there a part of you that, like those little ducklings, needs nurturing and protection—that needs you to honor its presence? 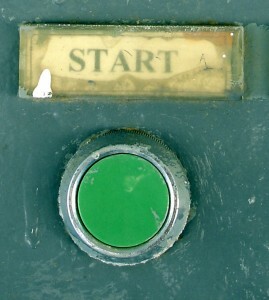 >> What am I being called to give birth to, to mother, or to bring to fruition? What part of me is fragile and in need of protection or even rescuing? What is calling out to be recognized, nurtured, or strengthened? >> Have I been too busy to give it enough attention? >> What choices can I make to give that part of myself more room to grow in my life? >> How can I stand up for that emerging part of myself? Do I need to draw boundaries to make room for this budding potential within me to blossom? How can I do that?